In studying protest events using news sources, it is important to recognize the non-equivalence of events and articles about events. Social movement researchers usually code information about protest events in news sources with the goal of drawing conclusions about the frequency and size of the actual physical events that led to the stories. But a reader’s perception of how much protest is going on and how important it is probably is affected by the volume of news coverage, the number of articles. Articles about events are not the same as events. Some events are written about multiple times, and some articles describe multiple events. Overall, protests are rarely described as isolated events, but instead are described as parts of stories or narratives that involve other events. The data come from the MPEDS project whose intellectual lead is Alex Hanna. Our goal is to develop a protocol for identifying protest events in news sources. Although the protocol is still being polished, we have used it to identify Black protest events from English Gigaword, a compilation of news wire stories 1994-2010. 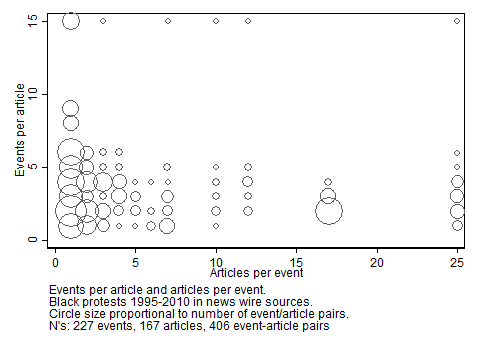 This search identified 167 articles that mentioned 227 distinct events in a total of 406 event-article pairs. Of the 406 event-article pairs, only 21 (5%) involved one article per event and one event per article. Of the 227 events, 167 (74%) were mentioned in only one article, but only 21 (13%) of these 167 events were the only event mentioned in an article. Most one-mention events were treated as subsidiary parts of a larger story about other events or patterns of events, and a significant fraction of one-mention events were actually references to multiple events that could not be clearly distinguished. The figure below displays this pattern graphically; the table version of this graph is at the bottom of this post. The horizontal axis is the number of articles that mentioned an event. The vertical axis is the number of events mentioned in an article. Each circle is proportional in size to the number of article-event pairs. The leftmost column of circles are all events mentioned in only one article, laid out by how many events (including that one) were mentioned in that article. So, for example, the second circle up in the leftmost column is proportional to the number of article-event pairs that involved one article per event and two events per article. Most articles (66% of 167) mentioned more than one event. One article, a 2000 Martin Luther King, Jr. Day holiday roundup, mentioned 15 specific events, including three that were often mentioned (10, 12, and 25 times) and 10 that were mentioned only in that article. (This is the row of circles at the top of the graph.) In addition, one of the “events” counted as only one event in this graph is the claim in the article that there were MLK Day events celebrated in all 50 states, of which the 14 other events were just examples. The specific event with 25 mentions (the row at the right of the graph) was an ongoing multi-year tourism boycott of South Carolina by the NAACP for displaying the Confederate flag; this boycott was frequently mentioned in articles covering associated protests and related boycotts in Georgia and Alabama and was tied to an ongoing “story” about whether and how the Confederacy will be memorialized. The events with 17 mentions, by contrast, were much more limited in scope. In December 1995, a person who had been part of ongoing protests against Freddy’s clothing store in Harlem killed several people in the store in a gun and arson attack. Although the protests had been going on for several months, there was no story about them in the news wires until the killing, and all 17 stories discussed both the killing and the protest. Some of the articles also mentioned other protests about the same issue, actions by Black vendors and others to support Black businesses and oppose non-Black businesses on 125th Street in Harlem. Events were rarely discussed in these news wire stories as isolated episodes. Events were discussed as parts of ongoing “stories” about issues such as the display of the Confederate flag or the aftermath of a killing associated with a protest or a series of events and counter-events demonstrating ongoing racial tensions in a community or on a college campus. News stories are not a like a CCTV camera on a corner that mindlessly records everything in its range. They are constructed by people who work for organizations who are telling stories about what is going on and what it means. Social movements intentionally seek to tell their stories to workers who write the news and news workers intentionally look for stories to tell and fit them into the other constraints they work with. Particular events are intentionally described as part of narratives that relate them to other events. In short, communications media are actors, just as much as social movements and their opponents are. Any theory for how movements operate has to treat everyone in the field, not just the movement, as intentional actors who are responding to the actions of others. Methodologically, this means that it is vitally important to collect the media context for an event. The huge Dynamics of Collective Action data set has only one record and one bibliographic source for each event, even if the event was discussed in multiple news stories. Coders were instructed to ignore additional stories about an event they had already coded, and no bibliographic information other than the number of stories was retained. There is no way to go back to the original sources to retrieve the underlying media context nor to compare how descriptions of the event might have changed over time. In this project, we kept track of each article-event pair and produced a crosswalk file linking article identifiers to event identifiers so that other researchers can retreive the underlying information. 28 (12%) of the events were anti-Black events, usually either the events that had precipitated the Black protests, or counter-protests. Enumerating events is often problematic. Of the 227 items recorded as single “events,” 32 of the were actually references to multiple events that could not be distinguished, usually referenced with with phrases like “protests in 25 other cities” or “50-100 protests last year” or “protests last month [or week or year]” or just “past protests.” (Most of these multiple-event events (26 of 32) were mentioned only once.) Additionally, some of the events are boycotts that lasted months or even years, as well as multi-day protests. Finally, 30 identifiable distinct events were parts of a larger event, as a series of coordinated rallies or rallies and counter-rallies.